Although magnetic nanoparticles are being used more and more in cell imaging and tissue bioengineering, what happens to them within stem cells in the long term remained undocumented. 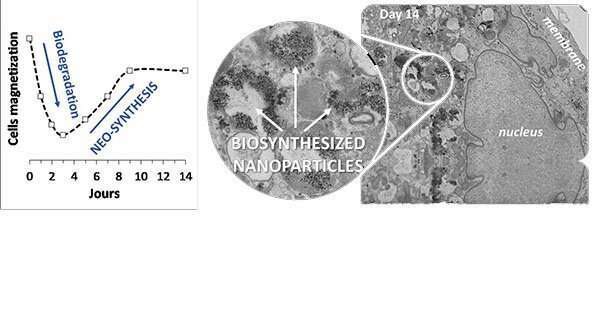 Researchers from CNRS, the Sorbonne Université, and universities Paris Diderot and Paris 13, have shown substantial degradation of these nanoparticles, followed in certain cases by the cells "re-magnetizing." This phenomenon is the sign of biosynthesis of new magnetic nanoparticles from iron released in the intracellular medium by the degradation of the first nanoparticles. Published in PNAS on February 11, 2019, this work may explain the presence of "natural" magnetism in human cells, and help to envisage new tools for nanomedicine, thanks to this magnetism produced by the cells themselves. Magnetic nanoparticles are at the core of today's nanomedicine: they serve as imaging diagnosis agents, thermal anti-cancer agents, drug targeting agents, and tissue engineering agents. The question of their fate in cells, after they have accomplished their therapeutic mission, was not well understood. To follow the journey of these nanoparticles in cells, researchers at the Laboratoire Matière et Systèmes Complexes (CNRS/Université Paris Diderot) and the Laboratoire de Recherche Vasculaire Translationnelle (INSERM/Université Paris Diderot/Université Paris 13), in collaboration with scientists from Sorbonne Université1 have developed an original approach to nanomagnetism in living systems: first they incorporated magnetic nanoparticles in vitro in human stem cells. They then left them to differentiate and develop for one month, to observe them long term in the intracellular environ ment and to monitor their transformations. By following the "magnetic fingerprint" of these nanoparticles in the cells, the researchers have shown that they were first being destroyed (cell magnetization falls) and releasing iron into the intracellular environment. Next, this "free" iron was stored in non-magnetic form in ferritin, the protein responsible for storing iron, or served as a base for the biosynthesis of new magnetic nanoparticles within the cell. This phenomenon is known to occur in some bacteria, but a biosynthesis like this had never been shown in mammalian cells. This could explain the presence of magnetic crystals in humans, observed in the cells of diverse organs, particularly the brain. What is more, this iron storage in magnetic form could also be a way for the cell to "detoxify" over the long term to counter excess iron. From the point of view of nanomedicine, this biosynthesis open up a new path to the possibility of purely biological magnetic marking in cells.